WISER has the pleasure of participating in the "UPMC My Nursing Residency" program at Magee-Woman's Hospital of UPMC. During the session, WISER assisted in conducting a First Five Minutes simulation session to help the participants enhance their knowledge related to what to do before the code team arrives. 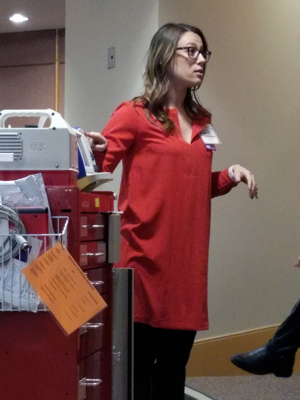 The lead facilitator for the session (pictured here) Ashley Medeiros, DNP, RN, CNL, is a Programmatic Nurse Specialist for Nursing Administration at Magee, and an instructor for the First Five Minutes course. The UPMC My Nursing Residency is a year long program for all newly graduated professional nurses. UPMC My Nursing Residency focuses on clinical leadership, professionalism, inter-professional team building, and evidence-based practice to build confidence in practice and bring socialization to the RN role. A series of 12 monthly, 4 hour programs are led by trained facilitators and coordinators to instruct, lead, and mentor at the unit level. The ultimate goal is to develop graduate nurse leadership skills and professional roles to positively impact quality outcomes and achieve a high level of professional and job satisfaction to positively impact retention.